My name is Laura Green and I just found your website tonight. I rarely ever use the internet for anything else than e-mail, but for some reason I decided to play around a little bit and see if I could find any information on the "Original Dinner Party". I went to a meeting last week and putting my logic and gut feelings aside talked myself into doing it. A friend and I were going to split a "plate" together. Thank God I'm poor because I had to take the time to try and figure out how I'd get the money. And in that time I found your invaluable information. I noticed at the meeting that the main discussion was about how "legal" it is, and crafty little ways to dodge the IRS. Money figures were not discussed and there were no math figures on the felt board, just some felt salad and dessert plates. They played on emotion and women's empowerment. That's great and all but if I'm investing or should I say "giving" $2,500 of my money to a stranger, I'd like to see some figures. After reading one of the articles or letters on your site the writer had statistics of the success rate. The meeting didn't touch on this a bit. They mentioned that only bringing in a few people would help the money maintain and circulate. Thank you Les for having this information available, you saved me $2,500 and some possible jail time or fees. You rule the Earth. I've got another question for you. Have you ever heard about an SAS loan. I received some information about it a week ago from a friend. It's from a company called Step 5 International. Supposedly it's a loan that you give yourself. This loan is supposed to pay itself off meanwhile sending you a check that gradually gets bigger every month. After 36 months you should have received about $146,000 all together. It's an initial one time $200 fee. Do you know anything about this? I can't find any information on it. Please write me back if you do. I'd love to hear from you. I was just introduced to you web page where you refer to the Original Dinner Party as a scam. I know hundreds of women who are successfully involved in this women's gifting group. Gifting clubs are legal in many states and I'm curious to know if you have any data to support the fact that you refer these women's groups as a scam. As all of the information gathered from my site came from court transcripts of convicted individuals or consumer warnings from the FTC, BBB or the Attorney General's office of the various states, I assume they generally consider the pyramid nature of the dinner party concept an illegal scam. The fact that some states have yet to legislate against it, which I find remarkable, is likely based on the fact that not enough complaints have been officially registered yet. If you feel that it is an honorable and honest process whereby all participants, ad infinitum, can benefit from the recruitment of an infinite number of new members and you can show how this is mathematically possible then I would be happy to present an opposing view. Any assistance you might provide in explaining the downfall of so many such programs in other areas would be great as well. For now I will have to go with the official view on the topic. Even though you suggest hundreds are successful, for their recruits to be so as well will require thousands and for those to be successful tens of thousands more will need to be further convinced of its merits. I do not doubt that there will continue to be many winners in such plans but eventually there must be an even greater number of losers. Perhaps my section relating to pyramids will demonstrate to you the mechanics of the process as seen by law enforcement officials. Thanks for writing and good luck avoiding prosecution if your state does frown upon the practice. So basically it is your opinion that this group is a scam. According to the Attorney General's own web page this group does not meet the definition of a pyramid, so I don't know how it can be compared to one. I would never do anything that was illegal, so I'm not concerned with prosecution. You say that not everyone will be profitable in this group, but what about Amway, or the stock market, there are no guarantees there. To tell you the truth I don't know whether your particular group is a scam simply because every local version is bound to be slightly different based on its operators. I have honestly not delved too deeply into your operation but have based my opinions solely on the research and views of others. I would be interested in having you fully explain how your system works and why you feel it is perfectly respectable and profitable for all participants. Providing your state location would allow me to involve the AG to get his or her official standing as well. For more info on the Dinner Party pyramid scheme process. I do so appreciate your website and wish I would've seen it sooner. However, it gave me all the ammunition I needed to try to get clear of the latest women's gifting scam. The Dinner Club has migrated down from the Bay Area to San Diego, is growing rapidly and it's now called The Garden Club. Each Garden has its own name, such as "Dreamcatcher Rose Garden," "Salsa Rose Garden," etc. The claim is that it came down about 6 months ago from the Bay Area. No mention is made of the Dinner Club, although the spiel is 100% the same, including the part about it being started 11 years ago in Canada by four philanthropic women. Instead of appetizers, the bottom 8 rungs are called, "Buds." The next 4 up a level are "Blossoms." The next 2 are "Blooms," and when a women is at the top, getting gifted 8 times $5K, she's "In Bouquet." The Garden also differs from the Dinner Club in that women are sponsoring one another in. If someone can't afford the $5K, another women pays it for her. When the sponsoree goes into bouquet, she pockets $20K and her sponsor pockets $20K. A win-win they say. One woman here claims to have been thru bouquet 9 times and to have sponsored 22 women in who have already bouqueted. There are Garden Parties at different locations all over this metro area, every other Sunday. There are conference calls twice a week and many gardens meet informally for lunch on Fridays. My sister and I have invested in this club and are now trying to get our money back, thanks to you. The intimidation and "hurting other women" spiel that has been flung our way has been quite disconcerting. Note: As of 09/11/02 there are operations in Lodi and Galt, California. I just completed reading your bashing of WEW and felt compelled to write for you obviously have no clue at all regarding Women Empowering Women. Most women who participate are intuitively led to the experience. I was gifted to participate in WEW over a year ago by a woman I had never met before whom I had spoken with for about ten minutes. It was a life changing experience on all levels. The gift received was not at all about the money. The energy created from the dynamics of women supporting women on all levels was beyond my wildest dreams. I grew enormously emotionally, mentally, spiritually and as a leader. Once I was gifted to participate, all kinds of miracles began opening in my life, in that instant! I would simply think a thought, and it would manifest itself. The very moment I was gifted to participate, I saw the Holy Mother and the Christ appear before me, and the gratitude brought me to my knees. You seem to be the type of person who would not understand it at all. I cycled through and gifted 3 other ladies all but $7,500 of the $40,000 I had received to participate in this most beautiful experience. The $7,500 was used to cover moving expenses, purchase a 1983 vehicle and buy used furniture, and get caught up on bills. I personally know women who assisted their communities in a big way. One created a Montessori school, another donated a library to her home village in Thailand, another a battered woman and children's shelter, another, a non-denominational church, among much, much more. One woman, whom I do not know, fed a whole village in Romania for a year. My heart and soul still believe so much in the experience that I continued emotionally, mentally and spiritually supporting other women involved in the process for an additional 6 months, freely giving of my time and energy to assist in the fullness of their personal experience. You have absolutely no clue what you are talking about! There is no investment. It is truly charity. It has thoroughly empowered my life in all ways. This is not about money making. These women are told this upfront. They are told there are no guarantees that one day, they too shall receive gifts from these other women, however, the Golden Rule is "Do unto others as you would have them do unto you". Whenever anyone does good for another without expectation of return, natural cause and effect occurs. What ye reap, ye shall sow. It may come in totally unrelated forms, but it does come. If however, women have an expectation of receiving money from this, that is when they get into trouble. Also, when they get greedy; and this can happen in the most sacrosanct churches and other groups; that is when they hurt people. I am exceptionally disappointed that your article shows you do not seem to understand basic physics, nor the workings of God and the workings of love. You keep calling it an investment scheme with payouts and entry fees. There are no such things in WEW. WEW is an experiential school of self discovery. When one is in dessert, it is unlike anything you are obviously aware of. If you have ever spoken to anyone who is a spiritual teacher/alternative healing facilitation teacher, you will learn that they hold the energy for all participants. They are the stronghold. This is a phenomenon which occurs with WEW. It is usually unspoken and requires energy even when you are focusing on other things. It is true leadership training. Women are very honest with women and are awesome teachers. The level of intimacy is beyond words. These women are still deep within my heart 1 1/2 years after I participated. The day I completed my cycle, the women had a send off party for me, speaking words of love, caring, appreciation and support of me. All I could do was cry. It is real and the people are authentic. They are not phony as you purport them to be. You think it is a money scheme/scam but you are wrong and I expect you to rewrite your article based on truth! I appreciate that you have taken the time to give your views and while I do not feel you have changed my mind I would like to post your reply as a dissenting view to mine so that both sides are heard. Obviously some branches of this process are more geared to money while some, like yours, stress other more charitable and emotional aspects. I would ultimately be more supportive if no money needed to change hands for the process to occur. Yes, you are right. And, it is very painful to see the distortions and the hurt that is created by impure intent. I heard about some groups in Texas and New Mexico who were having large "recruiting" meetings. I can only presume that they were not as intimate with one another, and were pushing the money/payoff scheme. That is why they got into trouble, using the name of charity, but with the intent of greed. There are bad apples in every good foundation but my experience was so different than that. In our calls, we shared our experiences with each other, got clear on our dreams and our issues for our inner healing, and supported one another to believe in ourselves, to empower one another. It was like a very difficult birthing process. At one point, I truly saw myself through the reflections of the ladies in the circle, and cried for two days, and prayed, and surrendered and made some major leaps in consciousness, core changes to my character, enhancing my ability to love myself and listen to others, and much more. We did not hold meetings in person, as these ladies were from all over the USA but sometimes we got to meet and embrace one another in person, and share quality, personal time together. I thank you for your honest response. I always look at all sides of an issue. And, I continue to hold my personal experience as dear to my heart and totally and completely life changing. All aspects of my life shifted to the better. I finally know that I am capable of accomplishing anything without doubting myself. I know who I am. I truly love myself. What a gift! And, in itself, a miracle. Much love to you and blessings! And, I do appreciate your service as well. There are more scams than not. It is a weeding out process, to find the true opportunities out there. You helped me win my court case! I participated in a gifting circle after being introduced to it by a very good friend that I trusted. After I joined, I had suspicions that it was illegal and started conducting my own research and found your site. I asked for my money back from the woman I gifted and she refused. Thanks to you and the information on your website, four other women and I banded together and took three people to small claims court and won! The judge wrote the attached twelve page verdict that outlines how gifting circles break the law in Colorado. I sent the full legal ruling so that you may share this with other women who may be planning a court case. Even though a lot of Dinner Party participants and potential participants might claim that there is nothing obviously illegal with the system, they certainly don't emphasize the really HUGE problem people could face with these schemes. As you note, some people actually made money in the original and now famous 1920's Charles Ponzi scheme, or so they thought until it went into bankruptcy court. This move to bankruptcy court is not uncommon amongst ponzi and gifting club schemes. Once there, federal bankruptcy law allows the bankruptcy trustee to unwind some of the debtor's past transactions and have the money returned to the trustee for distribution to the creditors. The amount of time he can go back varies from 90 days to at least a year for fraudulent transfers. Here's how it might effect a Dinner Party payout. You pay your $2,000 to the sponsors. Two months later, you receive $40,000. Yeah! Six months later, you see on the evening news that the Dinner Party sponsors have been arrested, sued in civil court, etc. So what do you care, you've got your profits! The sponsors file bankruptcy. Sorry, still don't care! The trustee sees that the sponsors have paid out $1.8 million dollars in the last year, but there are 500 people who paid in $2,000 and got nothing (the victims or "bankruptcy creditors"). The trustee's fees (and sometimes attorney fees) are dependent in part on the size of the bankruptcy estate that he or she is administering. Let me say that again. The trustee, the attorneys, and the victim's recovery is all dependent on the size of the bankruptcy estate. So just how does the estate reach its maximum size? The trustee files individual suits against the "successful participants." This allows the trustee to "unwind" the past payouts made by the sponsors. The sponsors are often in jail or insolvent, so it's not uncommon for the bulk of the bankruptcy estate to come from unwinding the payout transactions. So, you think everything is great because you got your $40,000 before the scheme collapsed? Guess again. The trustee sees your name on the list. He files suit and wins. He's got a judgment with cost, fees, and interest accruing at 12%. Let's say it's for $46,000. Ouch. But that's not the worst part. Most people who received an unexpected windfall of $40,000 six months or a year earlier can't just pay back $46,000 when the bankruptcy (BKO) trustee comes knocking with his federal court judgment. You find you have to sell that new car and those new clothes (at a huge loss). You can't "untake" that expensive vacation or remove the improvements to your house. So, you end up selling stuff that you didn't even buy with the $40,000 payout. You may even have to get a second mortgage to pay off the "winnings" you got from the Dinner Party scheme. You find yourself wishing that you were one of the "lucky" ones who simply lost their $2,000 "investment." After all is said and done, let's say that the trustee gets $1,000,000 back into the estate. Trustee and attorney fees are $200,000. That means that maybe 700 defrauded consumers (including you) split $800,000. Yeah! The theory is that even those who have benefited as participants have a "valid" claim against the bankruptcy estate, but only in the amount of their investment. Therefore, they stand in the same payout line as the other investors who lost everything. So if it happens to go this route you get $1,142 of your $2,000 payment back (with no interest for the three years that it was in bankruptcy). For people who thought they lost everything in the Dinner Party scheme, that's not bad. If you get into a Ponzi scheme and end up with more that 50 cents on the dollar, consider yourself lucky. There the norm is less than 10 cents. But heaven forbid you made money from earlier participants. I've seen it happen where a woman whose mother had a "promissory note" in a frequent flyer miles Ponzi scheme had received $10,000 in payments over a couple years, then died and left the promissory note to the daughter, who received $2,000 in payments before the scheme collapsed. The BKO trustee sought and received a $12,000 judgment against the daughter, even though she had not received any of the earlier payments. So much for being a "successful investor" in a Ponzi scheme. The gifting starts @ a $5000 entry as a Freshman. You recruit others into the 8 freshman boxes. The board then splits into two parts. You eventually move through being a Sophomore, Junior, and finally to the collection spot as a Senior. He and his mother proceeded to try and wow me with the prospect of having too much money. What a joke. Reading your articles, I could see every persuasion technique that was attempted. 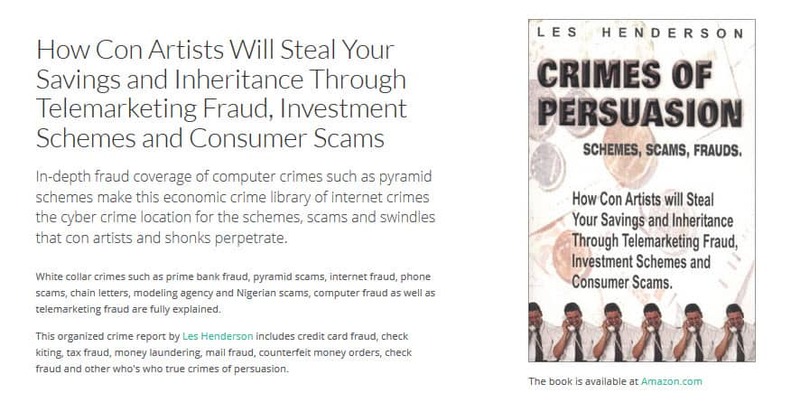 Little did they know that I am an impenetrable skeptic who likes to read about consumer fraud. I think they must be one of the top people who started it here, as they have a new Porsche, BMW, and Yukon in the driveway. I hope they all get busted and lose everything. It would be cool to see tow trucks in their driveway. The San Diego County District Attorney's Office states that the FBI office in San Diego takes complaints of this nature. The telephone number there is (619) 565-1255 should anyone else wish to report it. Thanks for all of the hard work you have put into this site. Thank you for the valuable information on gifting circles. I wish I'd read it before I lost so much money! For any woman out there: DON'T do it; there is absolutely no payoff. I got involved in the gifting circle because I was told that it would help empower women who really needed financial help (single parents, etc.) in addition to securing extra income for me. I bought one and one-half shares (or boxes) last August, and to date, have received nothing. The weekly conference calls were also an expense, but those have fallen completely apart. I could kick myself for being so stupid, but I feel worse for others (like my sister) who are single parents. Friends of my sister encouraged us to participate, and convinced us of the group's legality. The money I invested came out of my retirement funds (bad enough! ), but one woman in the circle actually "borrowed" the $5,000 from her credit card, so in addition to NOT making any money, she also has to PAY back her credit card. I can tell you that the promotional literature is so warm and fuzzy that it can make even the most intelligent woman feel as though it's a good thing to do. Many of the women in this particular circle who have been duped have advanced degrees and work in a variety of professions from education and nursing to public administration. Please encourage any woman who is thinking of investing in a woman's gifting circle that it is doomed from the start. I was invited to a WEW "Dinner Party" about a year ago and there was a lot of pressure to join and give up $5,000. My husband and I decided to investigate it as best we could on the internet, found out it was illegal and contacted the General Attorney. After many phone calls there was finally a press release about it but nothing else was done. The "Dinner Party" is still going strong here. Because of doing what we believed was right, I lost a good friend simply because she didn't believe me over the promoters. My husband also has to work with two women who are still VERY involved in it. They almost flaunt the money they make in front of him. So, my husband is known as the "bad guy" because we turned them in but unfortunately nothing ever happened to them. It saddens me that people are taking other people's hard earned money and not even caring. My only hope is that somebody else will realize it is illegal and get an investigator to a meeting. My sister and I joined a "Garden Group" in April 2002 through a "goood friend" of ours, whom we trusted. (after 8 women gift the bouquet leader $5000, she will receive a total of $40,000). She explained that getting involved in a garden would be the best way to resolve our financial problems though we weren't too sure about committing so my "good friend" introduced us to the elder of the garden, whose job is to psychologically manipulate fence sitters. My "friend" explained it was TOTALLY legal and said we would be guaranteed the money. My sister and I are finally in the "bouquet receiving position" but we read recently on the Los Angeles Times about a similar group getting busted. My sister and I feel completely betrayed and naive in what we got ourselves into. WE WANT TO GET OUT and just get back the $5,000 we put in. What can we do? I have received no money yet because no one wants to join the group anymore. Besides, I do not want to take anyone's money illegally. The elder of the garden has apparently gone through the garden already 3 or 4 times and made approx. $120,000 - $160,000 in less than a year.